Patchy Work of Mini Grey: Fun Fact! Fun fact I have discoverd while quilting this quilt. I am using two different types of thred, about 30 to 40 lines of green, then about 4 - 9 lines of yellow. Gutterman 100% cotton will sew about 9 lines before the bobbin needs changing. 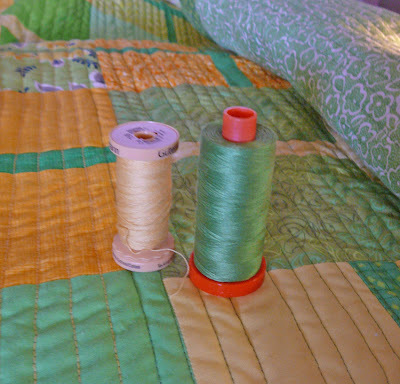 Aurifil 40 weight cotton thread will do about 39 lines before the bobbin runs out! There you go! Well that is interesting! I did a lot of quilting with a small spool of Aurifil and I must admit I did get a lot of bang for my buck. It's an awesome thread to quilt with. Sounds like the perfect excuse to make the switch to Aurifil! Thanks for the tip! Ia lot of pole told me, but I did not believe it... I should do then! I have found similar results.